Governance – AL-AYUNI Investment & Contracting Co.
AL-AYUNI’s management considers Governance as the fundamental factor of success. Accordingly, AL-AYUNI established the Corporate Governance Office (CGO) as part of the new business mode resulted from the strategic transformation program to strengthen the corporate governance and excellence at different areas and levels. The Corporate Governance Office reports directly to the Chief Executive Officer (CEO) and maintain its independence from the other business or commercial operations. We at the Corporate Governance Office is accounted as the authority on the overall corporate governance in AICC. The CGO with its different functions is the corporate governance Hub, around which multiple spokes embedded at different business units and construction management. The CGO with its function shall introduce, control, maintain and supports others to adhere to the entire governance activities of the Spoke. We create, improve, and sustain the framework including processes, procedures, and templates required to respond to the multiple governance needs of the business and operations we serve. Along with these controlling responsibilities, the CGO also takes delivery management responsibility of strategic initiatives identified by the AICC CEO and senior management as strategically critical. To establish, adopt and always maintain highest level of efficient governance and best practices across our company’s portfolios toward satisfied clients and shareholders. The CGO in AICC led by the VP CGO who has a direct functional communication line to the Chief Executive Officer (CEO) and provides C-SUITE Corporate Portfolio, Program, Projects, and construction operations support. 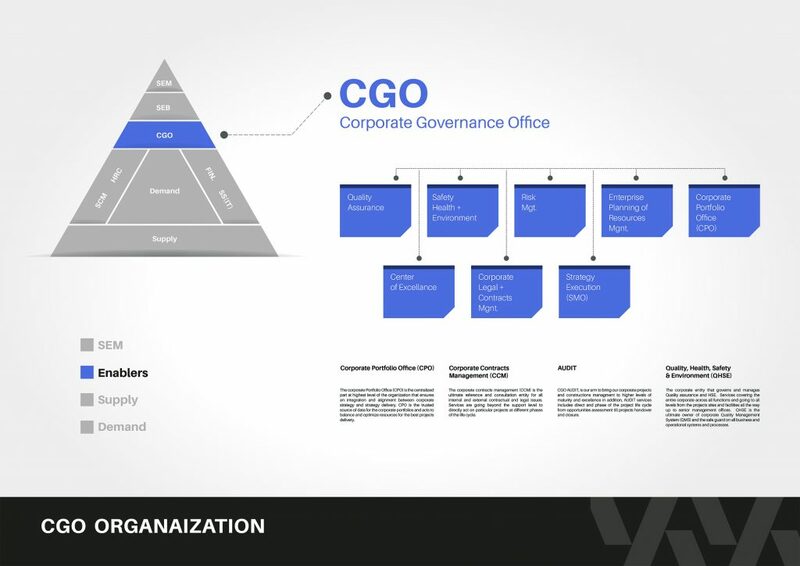 CGO as a governance system has to be in alignment with other systems and functions across the company and accordingly, CGO through its department shall be highly engaged with multiple departments across the organization. This section describes high level structure of CGO and the core services and offerings by different CGO departments. Further details of these offerings will be described in indevidial charters to be published for each department. The Corporate Portfolio Office (CPO) is the CGO Hub for the three Projects Control Office (Demand Spokes), Construction Control Office (Supply Spoke) and the Strategic Initiatives Delivery (CGO Spoke). The responsibilities of the CPO are diverse and essential in aiding AICC’s business growth. Moreover, successfully operating the CPO is vital to developing and sustaining AICC’s ability to achieve the vision and strategic objectives of the company towards delivering larger and increasingly complex projects and programs. The CPO will ensure, through its controlling Hub mechanism that the Spoke- Offices supports and adhere to the framework. Along with these controlling responsibilities, the CPO also takes supportive responsibility of projects identified by the AICC senior management as strategically critical. The CPO will boost AICC’s ability to identify, pursue, capture, and deliver the right project opportunities. Act as the custodian of the overall P3M governance framework at AICC, and augmenting AICC’s capability in the Business Winning and project delivery functions, to help identify, assess, pursue, capture, and deliver opportunities successfully. Oversee at high level and support utilization of project resources (Staff, Material, & Equipment) across business units and constructions operations and coordinate with business units to report to senior management about possibilities for better utilization of the capacity of resources. CGO QHSE is the enterprise entity that establishes, governs and manages Quality, Health, Safety & Environment systems. QHSE offers enterprise services across all functions and to all levels from the projects sites, Corporate HQ and all related facilities. QHSE is the ultimate owner of corporate Quality and Safety Management System (QHMS) and the safeguard on all business and operational systems and processes.  Serves as an agent of company and representative/liaison to a variety of external entities. In order to achieve smooth systems communications and integration, they have to consider same standards in order to talk the same language at the end. Accordingly, we had to set standard codes for all systems components including materials, assets, projects, activities and others. CGO has conducted deep analysis to prepare for an introduction of a suitable classification or coding system that we can use for our entire components. As a result, CGO has introduced Q Class System. ITQAN Classifications (Q Class) coding system, is an in-house customized coding system contains concept design and lists for each classification type references within the environmental construction organization. It contains for almost components of it Group, Sub Group, Section, Object and unique identity of a serial number. Q Class codes offer unique identify to our subseries, clients & stakeholders, business units, sub-business units, projects, activities, elements and all type of resources either assets or non-assets with a system achieved the hierarchical classification, homogenies and unique within the organization’s projects. CA Clarity is our selected ITQAN EPPM to automate the ITQAN framework in order to automatically manage our projects in a standard way and to generate reports for management and provide dashboard as required by ITQAN framework and management requirements. 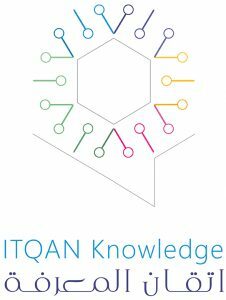 ITQAN EPPM is an advanced tool to support project management team to successfully manage and govern the projects by offering several functions and features required for projects. The Strategy Initiatives Delivery (SID) is the CGO arm and the CPO spoke to successfully set the balance and priorities then manage the delivery of the different strategic initiatives and ensure the alignment with our corporate strategy. Accordingly, SID shall lead the corporate transformation program (known as MAKEEN 10X). The SID Spoke shall utilizes ITQAN framework that the CPO-Hub creates to respond to the P3M needs for strategic initiatives delivery. The SID Spoke will focus on providing a spectrum of services through which it will act as a controlling and supporting entity for the internal initiatives delivery environment. CGO SID shall support Information Technology (IT) director to successfully design, develop and implement the enterprise automated solution.